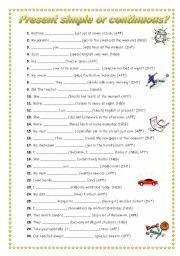 With this worksheet, students can practise the past simple tense of regular and irregular verbs. 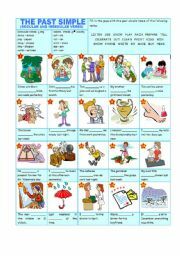 They have to complete the sentences with the past tense of the verbs in the box, and then they have to match the sentences to the pictures. I hope your students like this colourful worksheet! 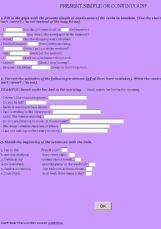 Students have to complete the 20 sentences with the verbs in the box in the past simple form. There are both regular and irregular verbs. I hope you like this worksheet! It has taken me a lot of time to reduce the size until I could send it. 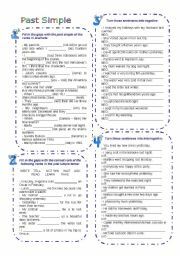 Four exercises in order to practise the past simple tense in affirmative, negative and interrogative. I hope you find it useful for your students! Worksheet to revise the zero, first, second and third conditional. I hope you like it! 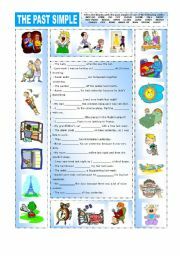 One page to revise present simple (3 forms) with beginners. I hope you like it! Merry Christmas and happy new year. 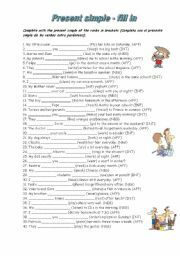 Students have to complete the 30 sentences with the verbs in brackets in the present simple or continuous tense. I hope you like it! Have a nice Sunday! 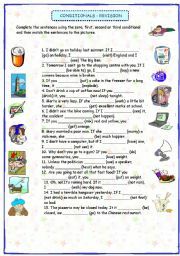 3 exercises to practise the present simple and continuous together. I hope you find them useful. 4 easy exercises to revise present simple and adverbs of frequency. It´s my first online exercise, so I hope you like it. 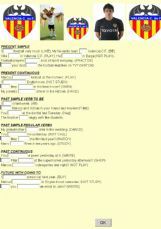 Review of verbal tenses for the 1st year of ESO (Spanish education). I hope you like it!